The auxMIC allows you to hear phone calls and play music through your car stereo. 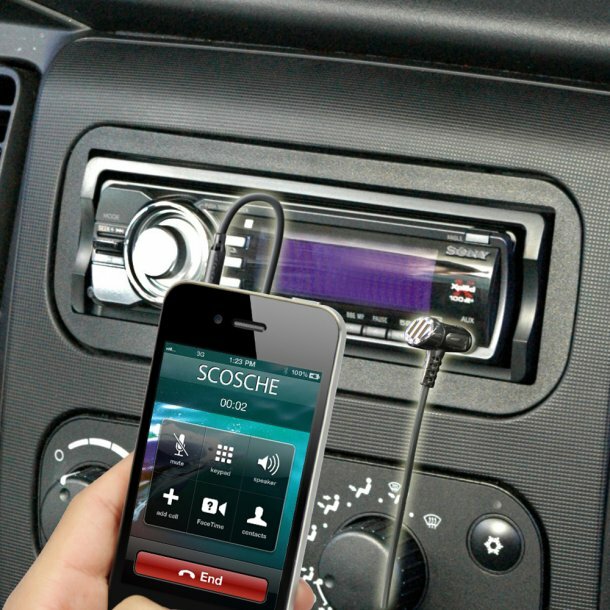 This handsfree mic and audio cable plugs directly into your vehicles MP3/AUX input. Click the button on the side of the auxMIC to answer/end phone calls without having to ever touch your device. Transmit high quality phone conversations or listen to music through the speakers of your vehicle. Use the included AUX relocation cable to mount the auxMIC to a surface closer to your mouth. Double-sided 3M tape has been included to secure this mount to your dashboard, center console and nearly any other surface. Measuring in at less than 1 inch when plugged in, the auxMIC has an extremely low profile. The short length makes sure that it will not interfere with normal operation of your stereo. Use the button on the side of the auxMIC to answer/end phone calls. A one-touch design enables you to control these functions without having to access your touchscreen device which can distract you from driving. This button also works while playing music to play/pause/forward track/back track.